1926 Born in Yamagata, Japan. 1956 Graduated from the sculpture honors course, the Tokyo National University of Fine Art and Music. Went to Italy as a beneficiaries of Italian government programs. Entered to the Marino Marini class in the sculpture department of Brera Academy. 1964 Received 7th TAKAMURA Kotaro Prize 1993 Recommended to be a member of the San Lucar National Academy. 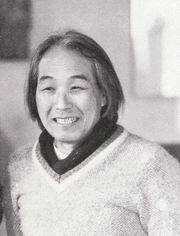 1996 Became first Japanese person to receive the Anbrozini cultural achievement prize from Milano. 1997 Erected "Piazza del tempo" in Kotodai Park as the 7th work for the 2nd stage of Sendai's "City with Sculptures" project. 1999 Received 30th NAKAHARA Teijiro Prize. His dramtic sculptural installations and graphical works have been shown and collected internationally, in Italy, Holland, the United States, Switzerland, Yugoslavia and Czechoslovakia.